As anyone not living under a rock knows, this past Sunday was Super Bowl night, the highest rated television viewing in the US, and the commercials are as important as the game. Considering that a 30 second ad runs $4 million in 2013, it’s a high stakes game for advertisers. As a marketer, it’s probable that I watch with a more acute sense of how an ad works than the average viewer. Often I am struck by how incredibly clever ads do very little to connect their cleverness to the brand they’re trying to promote… making me wonder if they move the sales needle at all. As a marketer immersed in social media, I am even more bemused by the glaring missed opportunities. At $4 million per 30 second spot, I cannot even begin to tally the amount thrown away by traditional ads that did not carry the conversation over to social networks. The first ad that really grabbed my attention was one by Taco Bell, featuring a bunch of Retirement Home residents ‘escaping’ for a night of partying, followed by a Taco Bell meal in the wee hours. The ad was cute, and it got the attention of many on the social networks, but it could have been so much more. Hopping over to Taco Bell’s Facebook page I saw just how much of a blown opportunity it was. There was ONE re-posting of the Retirement Home break out commercial, and it reverberated with their followers with almost 11,000 likes. Yet, as of Monday morning the last thing Taco Bell’s 9 million + Facebook followers heard from them was about a discount on Churros. There was no mention at all of the popular of “Big Poppa” commercial that had Twitter and Facebook buzzing. A Twitter hashtag search of Taco Bell during the game brought up @madisonpettis, tweeting to her almost 1 million followers that the Taco Bell ad was funniest ad ‘so far’ during the game… but not a peep from Taco Bell in response, despite the fact the tweet was retweeted 985 times. Taco Bell did engage with people who tweeted directly to it, but it was a lot of one word answers and no real building on their outstanding TV ads; they obviously weren’t listening to what was being said about their brand. What if the dad in the Big Pappa commercial, or his persona, was IN the conversation? What if Taco Bell got a conversation going among involved dads on their favorite times to swing by and get the burrito? What if the retirees were all tweeting about their night out and their plans for more to come? What if you could have asked them what happened next? What if Taco Bell had asked questions – mined for information about what their followers liked and didn’t like? What if they’d engaged in a meaningful way with many of the responses to their ads? Who knows what campaigns may have morphed out of it? What if they had actively engaged followers on their products and then LISTENED to and ANALYZED the responses to launch new user generated products?? It has been years since Old Spice Man hit on Alyssa Milano via YouTube and caused an internet explosion; I find it amazing that no one at Taco Bell thought of connecting their traditional and social efforts to capitalize on such stellar television ads. 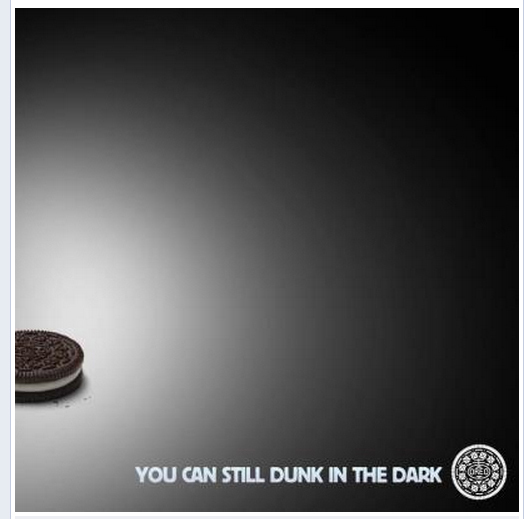 There was a singular example of what could be done interconnecting television and social media: the masterful job Oreo did of not only stoking the excitement their own ads caused, but taking the now famous opportunity to rif on the mid game power outage . 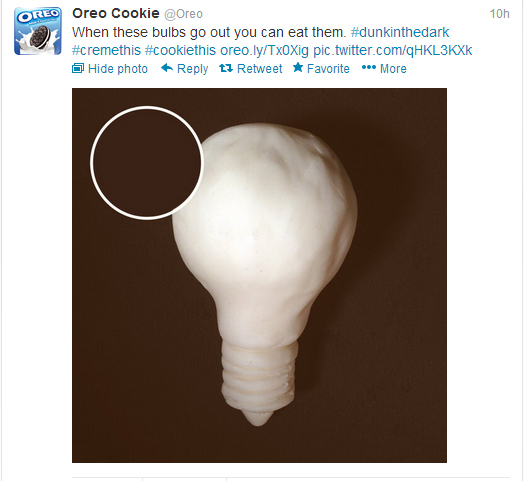 Obviously the team at Oreo is social savvy, and they’re a good case study in integrated agencies creating a smart campaign to recognize Oreo’s centennial. There were cries of well done across the social sphere. Obviously brilliant quick thinking came into play, but that brilliance didn’t happen by accident. And Oreo didn’t just capitalize on the power outage; they worked their social channels to build excitement prior to, during the game, DURING THE LIGHTS OUT, and post game. They got so much more bang for their buck by building momentum on their success. 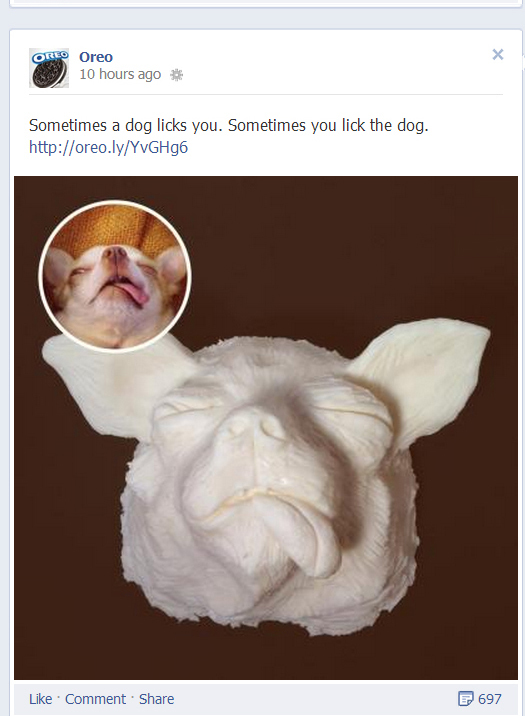 I found a considerable turn of irony in what appears to be a Chihuahua sculpture made out of Oreo cream that got traction in their social networks. My marketing mind could not stop considering what Taco Bell could have done with that classic Chihuahua dog via its own channels. Instead, Oreo took these incredible images to Instagram and other networks, including their Facebook page and its 31 million followers. Taco Bell’s ad created social buzz, but none of it was captured and expounded upon by them. Those of us involved in social marketing see so clearly what is apparently not apparent to many traditional companies; the advertising world has changed profoundly. Connected companies, the ones able to interconnect their marketing efforts, respond quickly to current events, and build an engaged audience will get so much more out of every advertising dime. joepringlesr I just imagine all of the retirees creating a persona and a story line like those silly cavemen… a new kind of retirement….